Often, the first question we answer from a perspective client is “Can I get an estimate?” or “Will you give me a quote?” We all want to know how much it will cost before we make a big purchase. RD Herbert offers estimates for residential, & commercial, green & metal roofs or custom sheet metal. When you call in, you will first speak to one of our Roofing Estimators (Daniel, or Steve ). They will ask you a few questions so we can offer you the best service possible. We need to know if you are seeking a new roof, re-roof, architectural sheet metal, gutters and downspouts, or maintenance. It is also possible that you need to speak to one of our custom sheet metal estimators. We need a little information regarding what time is available. Would you prefer to be onsite when we survey your home? Since we bring our own ladders, we can access the roof whenever it is convenient for you. We can schedule measuring your home within three days of the initial conversation. From that point we can give you your estimate within a week of the site visit. Give us a call (615-242-3501) for your roofing project and speak with one of our estimators. They have a few questions for you. 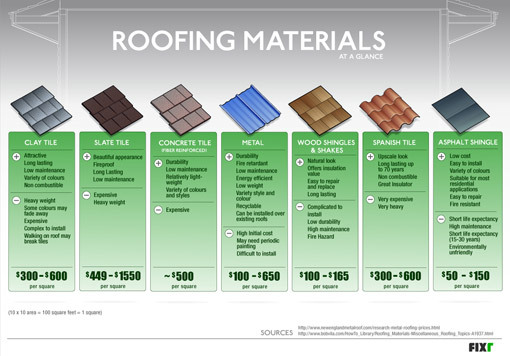 Take a look at the following info-graphic from Fixr for a basic idea of steep sloped re-roofing costs. Wouldn’t you like to see what your house would look like with new shingles, metal or slate? Some manufacturers allow you to design your house (or one similar) with the shingles of your choice and color. Or just browse through colors, styles and materials for inspiration. Spring and early Summer are the perfect times to visually inspect your roof. Start by walking around your home or business and looking for loose, missing or damaged shingles. 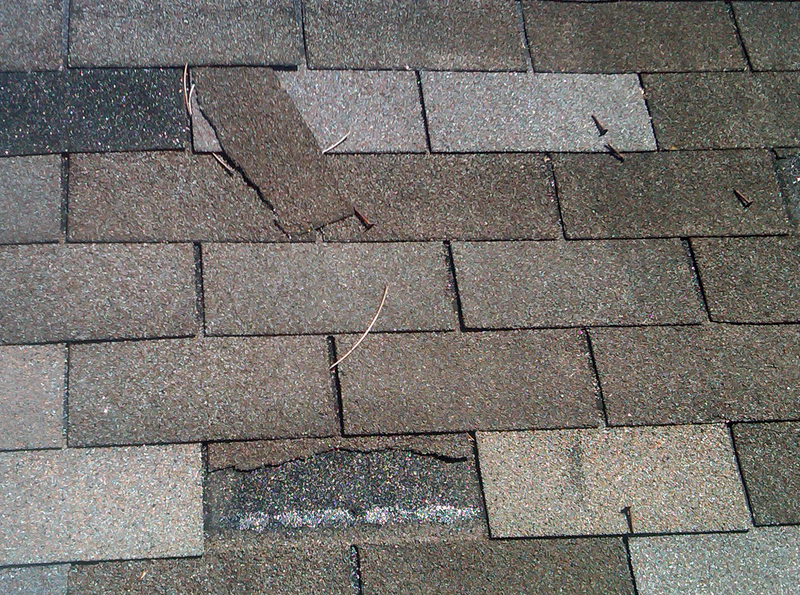 Blown off shingles are pretty common after a storm. Once gone, typically a fastener or two becomes exposed under the shingle. Water can get into the building around these fasteners. In the second photo, the shingles and felt are gone exposing the wood deck. Continual water onto exposed untreated wood quickly leads to rot and greater expense to the owner. The last photo shows about 15 shingles that came loose as a section. The most likely cause for a larger area to slide is improper fastening when the roof was installed. Shingles need to be replaced as soon as possible to ensure the longest life of your roof and to protect your home. Qualified roofers are able to fix these problems quickly and not further damage your roof in the process. We advise having your roof inspected and gutters cleaned semi-annually to catch simple problems before they become big headaches. 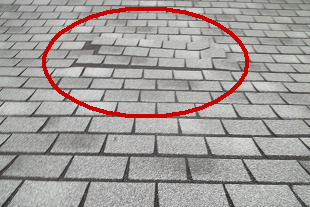 Having your roof inspected even when you don’t have a leak is important. Sometimes you can have problems that are hard to see from the ground. This morning you woke up after another strong storm blew through and you sense something is wrong. As you walk to get your first cup of coffee, you hear a drip. Entering your kitchen, you notice a puddle of water on the floor and your ceiling is wet. You have a roof leak. Don’t panic. This is a common occurrence and one that can be fixed. When you walk around your building, missing shingles are a good indication of a problem. You first need to contain the leak. Dry the area and get some type of catch pan underneath the leak. This prevents further damage and gives you time to figure out your next move. Go outside and inspect your roof. If this is your home, go ahead and take a walk around the house and see if you see anything unusual. 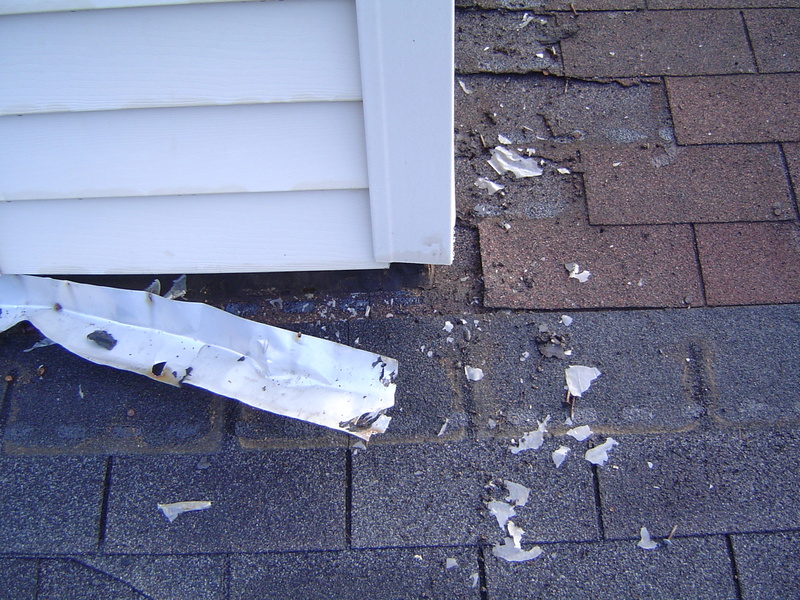 Blown off shingles or loose flashing around a chimney are good indications of the source of your leak. If this is a business and you can’t get on the roof, that is understandable. Note where the leak is and be prepared to show our technicians the room that has water. Is your roof under warranty? If it is, you should have a copy of the warranty filed away. 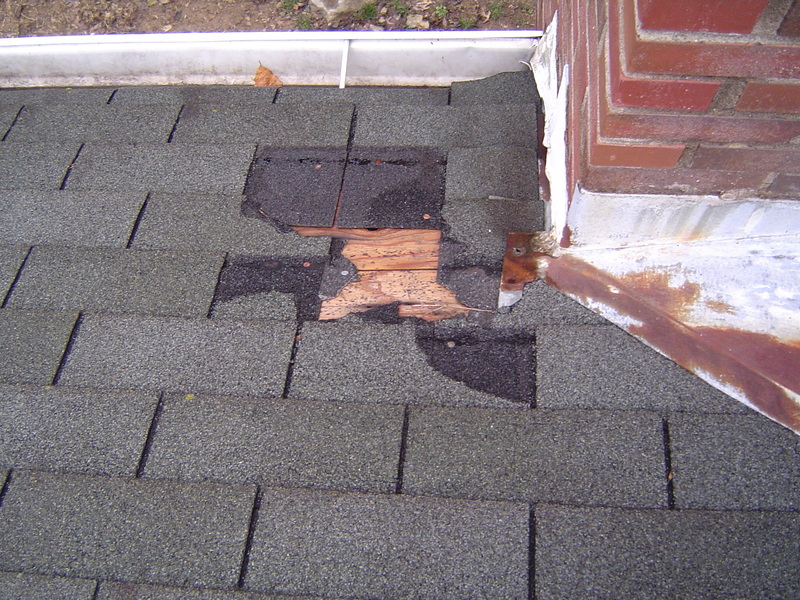 Most roof manufacturers require the owner to report the leak to directly to them first. The manufacturer then contacts the roofing contractor to come do the repair. This is an important step. Manufacturers are getting stricter on how they handle claims. If your roof is not under warranty, or you are not sure, you can now move on to calling RD Herbert and Sons. What should you expect when you call us? Once we receive a leak call at the shop we will need some information from you. Prepare this prior to your call to make the process smoother. any restrictions on gaining access to the room where the leak occurred or to the roof. We create a service ticket and add you into our rotation. We service the majority of our leaks on a first call, first serve basis. If you have an emergency, we will do our best expedite your ticket. Where is the water coming from? The metal apron flashing between the siding & roof pulled away leaving raw wood exposed. This allows water into your home. When people look up and there is a leak, the most common assumption is that the roof is the problem. However, the exterior of a building composed of multiple different systems all tied in together to form your building envelope. In addition to the roof you have walls, windows, floors, and the flashings that tie them all together. Because of this it can sometimes be difficult to pinpoint where a leak is coming from. When we go to fix a leak we try to fix the most obvious things first. We fix the defects that we can see in and around the area of the leak. We do this to eliminate these areas as the source of the leak and to keep costs low to you. Most of the time, this solves your crisis and we are done. However, sometimes a leak is more complicated than it appears. It could be coming through brick, traveling from a defect 30 feet away, or even coming from a air conditioning unit. Because of this you need to be prepared to monitor that area the next couple times it rains. If it leaks again, we need to go into a more in depth investigation of your problem. Ultimately we are here to help solve problems for our customers. Nothing makes us happier than a customer that is happy with our work. A roof leak can be a stressful situation. Make sure you follow the steps above and you will make it through just fine. 2 cupolas sitting in the sun. Finished #copper #cupola ready for pickup! #copper #cupola almost ready for installation.